This chocolate sorbet recipe is divine. It bursts with chocolate flavour. A dessert that not only wins on taste, but also is suitable for vegans and those who can’t eat dairy products. Although there’s no dairy, you’ll find it’s still a lovely texture, almost creamy. If you want to add a natural stabiliser that provides more creaminess to this sorbet, consider adding half a cup of this Italian meringue. You can slowly add more for an even creamier texture but adding too much will cause an egg flavour to overpower the chocolate flavour. Too much meringue will result in another dessert called spoom. I love this chocolate sorbet because I almost always have the ingredients lying around home to make this recipe. If you have some chocolate, cocoa and sugar at your disposal then get them out now. It’s time to make chocolate sorbet! 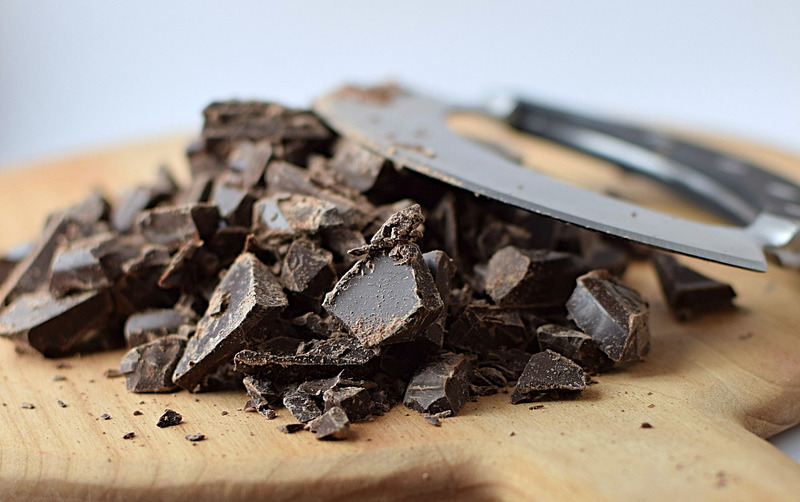 Choose a quality dark chocolate for your sorbet. Quality ingredients = quality ice cream. Making chocolate sorbet really just involves heating some water, sugar, salt and cocoa in a saucepan for a few minutes. Then you take the pan off the heat and add the chocolate and vanilla then refrigerate until completely cooled. It’s tempting to pull it out of the fridge early and start churning the sorbet. Don’t do this. The churn time will increase significantly which results in an icier, less appealing frozen dessert. If you use an ice cream machine without a built in compressor, you could end up with a slushy rather than sorbet. What a waste (unless you like slushies!). If you prefer ice cream, why not try making this chocolate vegan ice cream which also has no dairy ingredients? Whisk together the water, sugar, cocoa and salt in a large saucepan on a high heat. Bring mixture to a boil ensuring that you keep whisking frequently. Continue to boil (and whisk) for another 1 minute. Remove the sorbet base from the heat and mix in the chocolate until melted, then add vanilla. Add the mixture to a blender for about 20 seconds until nicely combined and smooth in consistency. Pour mixture into an airtight container and cool in fridge for a few hours or overnight if you have time. Churn sorbet in ice cream maker as per manufacturers instructions. Once complete, add to a container and freeze until hardened. No Replies to "Chocolate Sorbet Recipe"